Black-eyed Susans by American writer Julia Heaberlin is the story of Tessa, the sole survivor of a multiple crime that took place in Texas in 1995. Back then Tessa was 16, went by Tessie, spent her time running (she was in the track team) and with her friend Lydia. She had a normal life until one day she wakes up after someone dumped her in an almost dead state along with bones and corpses of other girls in a field covered with black-eyed susans. A man was convicted and sentenced to death for the crime. Flash forward to the present, the “killer’s” execution date is near. After all the therapy and time Tessa is scared when someone plants black-eyed Susans outside her bedroom window. She is not sure the man convicted is the real criminal and fears the killer is still out there, haunting her. And so we begin reading her flashbacks to her memories from the time after the crime, therapy, the trial, etc. as Tessa finally tries to face the truth about what really happened. I was attracted by the title of this book and the cover. 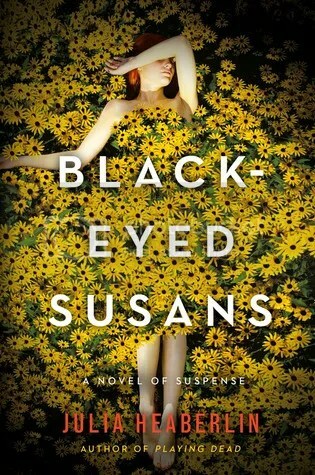 After reading the book, I would change the title to Black-eyed Susan. Changing the plural in the title and using Susan instead, is more alluring to me because this book is not about all the black eyed susans: be it the flowers nor the other victims, but just about one of them. Regarding the cover, the naked sad girl, wrapped up in a field of black-eyed susans is a great cover. It translates the story of the main character perfectly. That image is the depiction of Tessa not only in her teen years, but the Tessa of the present time. After reading the book you understand that she has been living like the girl in that image all her life, trapped and haunted by the black-eyed susans. It is a great cover. The font used for the title is captivating. The color palette and the composition screams suspense novel. Sadly, the ARC I received had a generic cover that had a black background and a single black-eyed susan. The premise of this book is intriguing but the way it was executed confused me. Even though it is a fast paced book in the sense that it’s made up of short chapters that I read in 2 days, it took me some time to get used to all the going back and forth in time. I was tempted to read all the 1995 chapters first and then all the present time chapters. I might do this in the future, IF I re-read this book, emphasis on if. Maybe that way it makes more sense. The story had me hooked up but the flow, how the story unfolds, took away from my reading experience. I felt like I had been reading for hours but nothing added up. It took too long, almost halfway through the book for me to get the hang of the back and forth in time and feel like I was really invested in the story. It felt like when you’re solving a puzzle blindly, you’ve put some pieces together here and there but have so many missing pieces left that it’s impossible to figure out the puzzle image. Black-eyed Susans is a puzzle that the reader has to slowly solve. Each chapter is a puzzle piece, you can’t skip any or you’ll have an incomplete puzzle in the end. I don’t feel like I have a favorite character in this story. They were all OK, but I couldn’t get too invested in any of them. There’s Tessa, her teen daughter Charlie (who at times seems more mature than her mom), Effie the senile neighbor, Lydia the best friend (I knew from the get go there was something fishy about her), the shrink (whose name I don’t remember) that Tessie went to therapy to, Bill the lawyer who is trying to get the convict out of death row, Joanna the forensic scientist, a.k.a. the mitochondrial DNA genius, from whom I learnt a lot. Like the chapters in the book, these people are important parts of the puzzle, without them it would not make sense. I don’t agree with the blurb because this was not a shocking and intense read for me. It wasn’t that dazzling of a psychological thriller either. Yes it has some suspenseful moments that make you guess and try to figure out who the killer is, but to say it was dazzling is a bit too much. It is a good book in theory; I just think it could have been better. At times it felt like I was reading young adult fiction rather than adult fiction, especially when reading Tessa’s flashbacks from her teenage years. There was a total lack of parental figures and it seemed like she was practically living an independent life at age 16. For a teen that was abducted, almost murdered and dumped with bones and corpses, there’s no mention of her father supporting her or being present. And in Tessa’s present, her daughter seems to practically have a life of her own and like I said, the girl sometimes showed more mature behavior than her mom. My main issue with this book is that there were loose ends, and I don’t like loose ends in my books. This book left me not knowing EXACTLY what happened to Tessa, it is never stated clearly. And then there’s Lydia, there’s a lot about her that the reader is left not knowing. If those loose ends were explained, even though it would make the book a little longer, having a clear picture in the end would give the reader more closure; it would’ve got a higher rating from me. What I really enjoyed was all the forensic science mentioned in the book. I wasn’t aware of how advanced the methods for solving these types of crimes are. I was pleased to learn about mitochondrial DNA and its application to identify murder victims. I didn’t know what geochemistry was. I think it rocks! Like the author I also understand more than ever that we are the earth. All this scientific mambo-jumbo-to-some is what I happily take from this book. In the end, Black-eyed Susans wasn’t about suspense, mystery or crime solving. In my humble opinion it was more about friendship, and the effects of jealousy, rivalry and deception on it. It is also a book about letting go of the negative things/relationships/problems/memories from your past. Learning to not give them the power over us is a hard process but it can be done. We can’t let our sanity held hostage by them. Only when you stop dragging them around, when you truly let go, you are free. fugue state. noun. A dissociative disorder in which a person forgets who they are and leaves home to create a new life; during the fugue there is no memory of the former life; after recovering there is no memory for events during the dissociative state. In fact, she isn’t paying me a fortune, because it’s a sad fact that most damn rich ladies no longer appreciate the cost of things made by exacting, artful hands. Not when everything can be purchased from China with the click of a mouse. I received an Electronic copy of this book but was not financially compensated in any way nor obliged to review. The opinions expressed are my own and are based on my personal experience while reading it. This post contains affiliate links as stated in my disclosure policy.